Injured in a Swimming Pool Accident? The joy of swimming can be a wonderful experience. Unfortunately, swimming pools, saunas, and hot tubs are amongst the most common locations where a wide variety of serious accidents and injuries occur. Private and public pools and swimming areas are the sites of thousands of serious and catastrophic injuries, as well as drownings, every year in West Virginia. Angotti & Straface Attorneys at Law L.C. hold property owners responsible for the injuries that you have suffered as a result of their willful or negligent conduct. 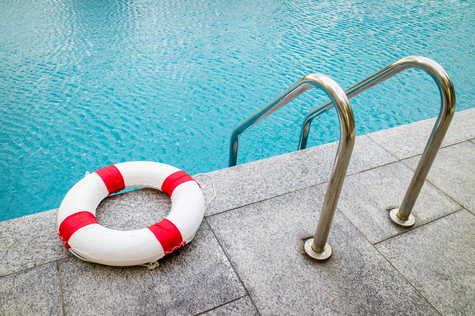 Since 1952, we have successfully represented those who have been seriously or catastrophically injured in avoidable swimming-related accidents, as well as the families of drowning victims. Many pool injuries are the result of someone else’s negligence. Along with pool and spa ownership comes great responsibility to guests that will use these items, including following all local, state, and federal regulations. Improper chemical and pH balance, sanitation, failure to maintain the filter and keep algae and bacteria growth under control are amongst the most common causes of a surface that is simply too slippery to walk on without slipping and falling. Additionally, all pools should be fenced at all times when not in active use and under proper supervision. There are many issues that contribute to these types of accidents. If carelessness or negligence contributed to your accident, contact our law firm for a free initial consultation to discuss your claim. Swimming pool accidents tend to be extremely traumatic and cause serious injuries for victims, including injuries that may cause permanent disabilities. Many of those injured require lifelong medical treatment and personal care services that are extraordinarily expensive. Typically an insurance claim will need to be filed. Remember that the insurance companies have their own best interests in mind. At Angotti & Straface, we work for you. We represent the interests of injured clients in Parkersburg, Huntington, Charleston, Wheeling, Morgantown, and throughout West Virginia. Contact us for a free initial consultation to discuss your claim at: (304) 292-4381. We will collect the evidence required to build the best possible case to help you recover the compensation that you deserve. As always, you will deal directly with your attorney and we will keep you fully informed throughout the entire process. Our goal is to secure the maximum possible compensation allowed by law for your case. Do not wait. Statutes of limitations apply.